This means every user can access his webmail on “mail” subdomain. 2: ) Setting up roundcube. First we need to add a new field to login form for domain. Edit file ./program/include/rcube_template.php. Add folowing line inside “private function loginform($attrib)” function. I placed it between “$input_user = …” and “$input_pass = … ” to maintain the correct order according to login form. With automatically filled domain field for every domain (http://mail.domain1.com will show “domain1.com”, http://mail.domain2.com will show “domain2.com” etc.). Now every user should be able to log in with his username only, when accessing webmail on his subdomain. You can also manually modify this field and type in a different domain or even leave it blank and log in using full e-mail address as username! Please feel free to leave any comments or suggestions, and keep in mind, that I’m not a php programmer, so there could be some other (or better) way to achieve this. 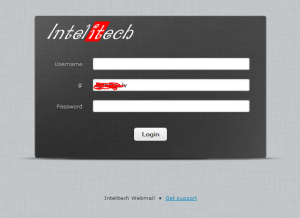 This entry was tagged webmail Roundcube hosting ispconfig. Bookmark the permalink. Lighting and blinds controller… on arduino.